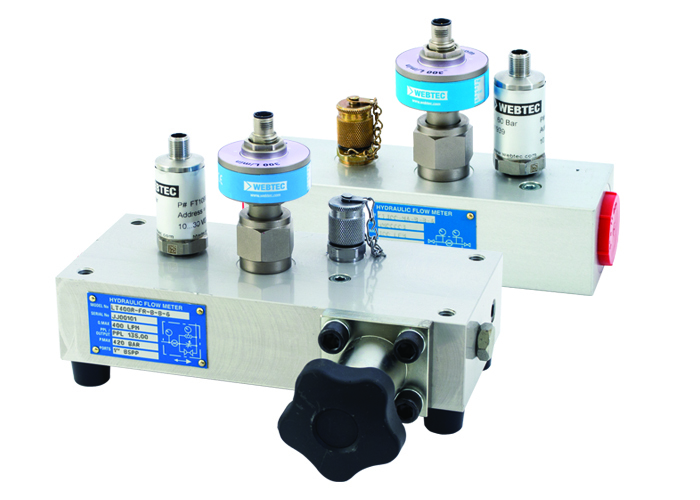 The new SAE J1939 CAN range of hydraulic sensors from Webtec are designed for OEM Mobile and Industrial applications where the user needs real-time continuous monitoring of hydraulic flow, pressure and temperature on high-pressure hydraulic systems for closed loop control, to predict imminent hydraulic failure or for diagnostic fault-finding. The CT turbine flow meter range with SAE J1939 compatible output provides a convenient digital solution to measure flow and temperature in hydraulic systems. The flow meter can be installed anywhere in the hydraulic circuit for production testing, commissioning, development testing and analysis of control systems. With the addition of the manual loading valve on the CTR meters further test scenarios can be simulated and monitored such as pump efficiency. J1939 pressure sensors are also available to compliment the flow and temperature meters and can be mounted directly onto the flowmeter. When combined with a pressure sensor all the fundamental parameters of a hydraulic system can be monitored in a single, compact unit with one cable supporting the J1939 protocol.